Hate groups walk a very particular line, only they don’t know it. On the one hand, it wouldn’t be out of line to call members of the Ku Klux Klan and related organizations domestic terrorists. Entire seconds of research shows us a vast number of murders, lynchings, rapes, and attacks that are physical, emotional, and psychological in nature. That’s the strange dichotomy of hate groups and racism as a whole. It’s a blend of the idiotic and the dangerous, and that dichotomy is what prevents our country from reckoning with the crimes of the past and healing. Meanwhile, the rest of us have to either deal with this nonsense in our day-to-day lives or reckon with our culpability. I may not be all the way woke, per se, but I know I’ve got miles to go before I sleep, you know? But what happens if you’re not a straight white dude, and you get involved with an institution that’s historically a stronghold of straight white dudes? Ron Stallworth knows a thing or two about that. 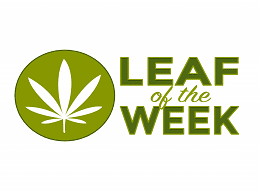 In the 1970’s, he lived in Colorado Springs and became the first black police officer and detective with the Colorado Springs Police Department. He had a very strange experience, and the mighty Spike Lee brings that experience to life in his new film BlacKkKlansman. As it turns out, that will happen quite a lot to Ron. His career in law enforcement begins in the records room, but his dreams are bigger. Ron wants to be an undercover detective. That’s never happened with a rookie, and it’s certainly never happened with a rookie who’s also a person of color. Ron is persistent, and Chief Bridges (Robert John Burke) reluctantly assigns him to infiltrate a black student group hosting a speech by former Black Panther Kwame Ture (Corey Hawkins). He’s got a knack for the undercover stuff, and he connects with the fiery activist Patrice (Laura Harrier). Patrice is understandably suspicious of cops, but Ron “passes” as a civilian. This is by no means the first time we’ll get into the subject of someone passing for something else. Ron takes it to the next level when he sees a recruiting ad in the paper for the Ku Klux Klan. Inspiration strikes as Ron calls the number. Walter (Ryan Eggold), the local chapter president, responds, and Ron unloads a veritable trashcan of racist invective. Turns out the very black Ron is just what the very white Walter is looking for to swell the membership of the KKK. 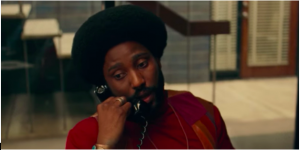 A meeting is arranged, and Ron’s undercover colleague Flip Zimmerman (Adam Driver) will meet Walter as the “real” Ron Stallworth. The good news is that Walter and hulking dimwit Ivanhoe (Paul Walter Hauser) take an immediate liking to “Ron.” The bad news is that hair-trigger maniac Felix (Jasper Paakkonen) immediately suspects Flip is Jewish, which he is. Ron and Flip must share an identity as The Stallworth Brothers, successfully infiltrate the Klan, and attempt to stop a moment of Charlottesville-like violence. 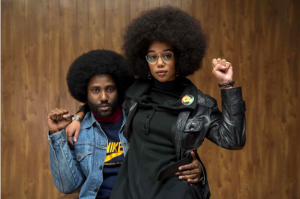 BlacKkKlansman is Lee’s most accessible film in years, a skillful blend of popular entertainment and righteous anger. All films are the product of their times, and this film is no different. It’s high-level trolling against the Trump Administration, and a reminder that we’re not so far away from the Civil War or the 1970’s. However, this is more than a grumpy screed against racism and facets of the modern Republican Party. Lee effortlessly juggles the tension of the investigation, the sweet romance between Ron and Patrice, and the banalities of the Klan, and he does it all without sacrificing tone or pacing. We’re lucky to have a filmmaker like Spike Lee. He stands in the first rank of American directors with Scorsese and Spielberg, but he’s never quite gained the same level of respect. That’s probably because he’s also one of our most fearless and political directors. He’s made some crowd pleasers like Inside Man, genuinely strong films that went almost totally unseen like Chi-raq, and Do The Right Thing, one of the greatest films ever made. Lee has no interest in sugar coating racism, and his films are precision-engineered to piss you off. While Spielberg wants you to love him, Lee welcomes your fury. Along with the simmering rage, Lee and his co-writers Kevin Willmott, David Rabinowitz, and Charlie Wachtel have written a screenplay with an impish sense of humor. They’re interested in the group dynamics of the Klan, and there’s a funny bit where we learn that the costs of hoods are not covered by the yearly membership fee. Along with the humor, the script takes pains to empathize with the characters. We can see flashes of the crippling fear lurking under the white supremacist bravado. The script has a recurring theme about concealing your true self. We see that with Ron concealing he’s a cop from Patrice, Flip hiding his Jewish identity, and how the truth ultimately bubbles to the surface. Actors love working with Spike Lee, because he’s able to provide them with strong characters and coax out equally strong performances. 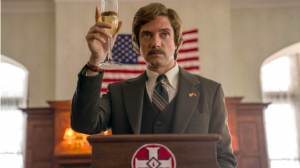 Topher Grace plays Grand Wizard…I’m sorry, I meant National Director David Duke as a satanic Ned Flanders, using bland slogans to conceal hateful invective. Alec Baldwin appears briefly as the amusingly named eugenicist Dr. Kennebrew Beauregard, and his scene is intentionally reminiscent of a certain Bill O’Reilly clip. As Patrice, Laura Harrier is an effective unyielding idealist. Jasper Paakkonen’s Felix is a creepy and alarming antagonist. This film really is a two-hander between John David Washington and Adam Driver. Spike Lee’s camera loved Denzel Washington, and Denzel’s son gets the same treatment. As Ron, John David Washington is funny and determined. He’s not quite as emotionally open as his old man is, and there are a few moments where we should get a strong sense of what Ron’s feeling but don’t. I think Adam Driver probably walks away with the movie as Flip, and there’s a strong scene where the non-practicing Jewish man has to outdo the white supremacists in anti-semitism. Flip has gone for years without being forced to confront who he really is, and Driver subtly shows us his conflict. He’s equally funny in a scene where he learns to mimic the “white” Stallworth voice by repeating James Brown lyrics. 2018 has been an excellent year in movies, and BlacKkKlansman is one of the year’s best. This film recognizes the jagged wound of racism past and present, and it responds with a furious middle finger. Spike Lee is working at the top of his game, and he’s made a movie that must not be missed. *Take a look on Google at the images from last year’s protest in Charlottesville. A veritable sea of polo shirts, khakis and tiki torches, and these guys are supposed to be the ones leading us to a brighter tomorrow? Please. **As a completely bald man, it kills me to see amazing hair like that.